With the poor haylage harvests across western New York this past summer there is a lot of concern about having enough feed to make it through the winter on a lot of farms. It is very important to determine how long feed will last now while many management options are still on the table. Once an inventory is taken, adjustments can be made to get the most out of silages and hay on hand. Farms that had timely rainfalls and reasonable yields this past year can also benefit from knowing how much feed they have on hand. Selling extra feed will provide additional income and also help other farmers across the region meet their needs. Preliminary silage inventories can be taken while filling silos by recording wagon weights and dry matter content. With good management, silage storage losses are generally < 10% DM and feed out losses are < 3% DM. Minimizing the area of silos exposed to air and feeding out at least 4 inches a day can keep these combined losses from climbing to 20-50% DM loss. If silage weights were not taken prior to storage, measurements of silage dry matter, volume, and bulk density will be necessary to determine feed inventory. Dry matter content is given on most forage quality lab analyses and this measurement can be done on farm with an NIRS unit, a Koster tester, or even a microwave to account for weekly, or even daily dry matter variation with precipitation. 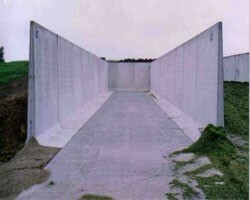 To calculate the feed volume in bunker silos, separate the rectangular and triangular sections. The feed volume of upright silos and silo bags can be calculated in one step. For feed volume equations see Figure 1. Bulk density measures how tightly the feed material is packed. Higher bulk density means more material in a given volume. The bulk density of most silages range from 10 to 20 lbs DM/ft3, with about 14 lbs DM/ft3 considered ideal, approximately 40 lbs As Fed/ft3). Measuring is necessary to determine an accurate bulk density. One method for measuring bulk density is the following: drill with a 12+ in probe into the face of the bunker or bag in at least a dozen locations, dry and weigh the feed, then divide the total dry weight by the volume sampled. However, drilling with a probe is time consuming, can be dangerous, and the accuracy can be compromised if the whole silo face is not represented by the sample locations. Bulk density is more commonly measured by taking the load weights multiplied by silage DM% then dividing by the volume of feed removed. Accurate measurements of silage DM% and load weights, evenly facing the bunk/bag, and correctly calculating the volume removed are vital to making this method of bulk density work. Bulk density is not consistence in vertical silos, because the bulk density is greater at the bottom of the silo (~21 lbs DM/ft3) compared to the top of the silo (~7 lbs DM/ft3). For every silage structure, multiply the dry matter, volume, and bulk density to determine the amount of feed on the farm. Dry hay inventories should also be taken by multiplying the average DM% from a group of bales with the average bale weight and the number of bales. Once forage inventories are taken, the rate of feed removal needs to be determined. If silage and hay are weighed on a daily basis, then the daily forage removal = total forage weight fed * forage DM%. For farmers who don't weigh their forages directly, daily forage removal can be estimated by multiplying the DM weight of each forage fed to each animal by the number of animals for each feeding group. Remaining forage/daily forage removal = days of forage remaining. Once this is known, management decisions can be made in order to avoid running out of feed. For discussion of forage inventory management see my blog at http://billsforagefiles.blogspot.com/.